Please join United Patients on 18 September 2018 for an important discussion on how patients and their physicians can work together to communicate more efficiently and effectively. 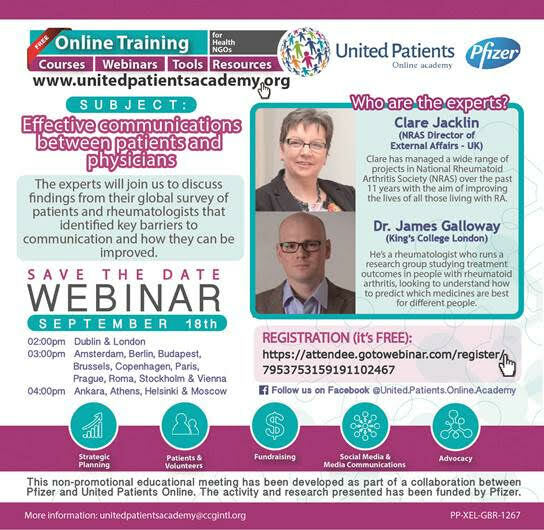 Dr. James Galloway (Rheumatologist, King’s College London) and Clare Jacklin (National Rheumatoid Arthritis Society [UK]) of Pfizer’s RA NarRAtive Initiative will join us to discuss findings from their global survey of patients and rheumatologists that identified key barriers to communication and how they can be improved. Clare Jacklin (NRAS Director of External Affairs – UK) Clare has managed a wide range of projects in National Rheumatoid Arthritis Society (NRAS) over the past 11 years with the aim of improving the lives of all those living with RA. James Galloway (King’s College London) He’s a rheumatologist who runs a research group studying treatment outcomes in people with rheumatoid arthritis, looking to understand how to predict which medicines are best for different people. Registration information via this link.